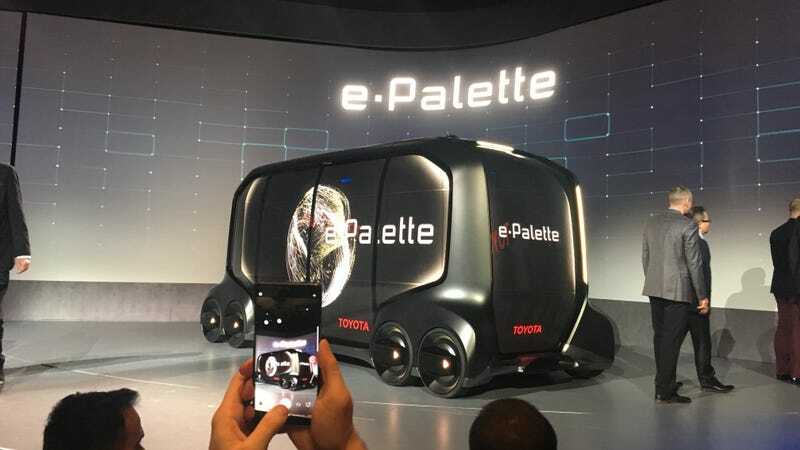 Introducing Toyota’s new body pod concept called the e-Palette at this year’s CES, the automaker’s president, Akio Toyoda, offered up a few ideas on how it could be utilized: parcel delivery, ride sharing, mobile e-commerce. Toyoda had one more: Burning Man! Yowza. Toyota scored a number of big-name partners to announce for the rollout of e-Pallete, including Uber, Amazon, Pizza Hut, and Mazda. It’s aiming to launch the service at the 2020 Olympics in Tokyo. When that happens, Toyoda told an adoring crowd of tech fanatics, he pitched the weird, self-driving boxes as a perfect utility for another Very Silicon Valley event. “Just think how great e-Palette will be at Burning Man,” Toyoda said. Hot damn. Coming from Uber’s CEO or any cookie cutter Silicon Valley startup, this would be a throwaway comment. But it’s Toyoda! Expectedly, those in attendance were caught off guard by his insistence that e-Palette could be used at Burning Man—no, folks, this thing will be at Burning Man. It’s a brave new world folks. You know we’re in a new territory when the president of the world’s largest automaker is pitching his tech thing as a device to be used for the annual pilgrimage to Burning Man. I think it kind of depresses me, too.